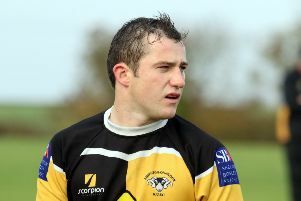 Player-coach Matt Goode said the club’s strength in depth was the difference between Banbury Bulls and Oxford Harlequins. In a thrilling contest, Goode felt the late tries were harsh on Harlequins in Saturday’s Wadworth 6X South West One East derby in which Bulls emerged 26-12 victors. Harlequins played some great rugby at times but, with several players playing out of their natural positions, Bulls showed great character to see the game out. 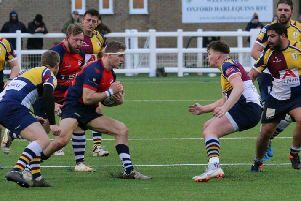 Justin Parker had a superb game at scrum-half, Ed Phillips was great playing out of position at fly-half while the Banbury pack were strong throughout. The scrum was dominant all game, winning several penalties and being a constant threat. Pete Boulton was strong in the scrum carried brilliantly all game, helping secure the late bonus point for Banbury. Goode said: “Our grit and determination got us through but I thought Quins were outstanding. For large periods of the game, they were on top. “Our defence was fantastic and we had to really dig in at times. To score at the end was a bit unfair as I’m not sure we deserved all five points. “Quins were outstanding and put their bodies on the line. We did exactly the same and the game could have gone either way but we just had that edge. “Our bench were great and they were probably the difference, getting five points ugly is crucial in this league. With the squad we’ve got I hope we can do it again this week. “It showed the depth we’ve got, Matt Powell at centre who is our starting seven was brilliant. Tommy Gray stepped in at 12 for a bit as well and did great. I can’t praise the boys that played out of position enough, they played really well.